Three fragrance launches by the same perfume house at the same time can be overwhelming. When samples of Lubin Korrigan, Galaad and Akkad Eaux de Parfum arrived, it was easy to toss them aside with the intention of giving them a thorough going-over some time later. “Later” turned into months. This week, discouraged by a few department store fragrances I sampled and couldn’t bear, I dug out the Lubins. My faith in modern perfumery is restored. Korrigan was developed by perfumer Thomas Fontaine and has notes of leather, wild apple, juniper, saffron, cognac, lavender, ambrette, cedar, oud, vetiver and musk. Supposedly, Fontaine modeled the fragrance after an imaginary tree called “Caramel Wood.” From that description, I expected a sweet, two-dimensional fragrance. Caramel and wood: it sounds perilously close to Aquolina Pink Sugar. Instead, Korrigan is sweet, but for its first ten minutes on skin, it’s also dirty with civet and leather. The dirtiness fades away, and the fragrance fills with boozy musk, giving it both a gourmand and clean feeling. Although it’s not listed — and maybe it’s a trick of the notes — I smell tobacco, too. Cedar and vetiver add enough of a green edge to complicate the fragrance nicely. 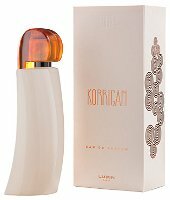 Still, to me, after an hour or so of wear, Korrigan almost smells like a Brandy Alexander-scented soap that stumps you as to whether you should scrub with it or bite into it. Korrigan lasts a good long time — nearly eight hours on me. Eight enjoyable hours, I'll add. Perfume Delphine Thierry developed Galaad, and it has notes of myrrh, cypress resins, cedar, leather, cardamom, rosemary, honey, copahu balm, oud, cypriol and blond tobacco. On smelling Galaad, I was reminded of another perfume, and it came to me on day two of sampling: Hermès Bel Ami. Galaad could be Bel Ami’s fresher, greener brother, complete with Bel Ami’s signature funk. At first, Galaad is all fresh lemon and resin, like the scent of a cat who has been lounging in the rosemary and arborvitae — with a twist of lemon rind (I wince thinking of how the cat would hate that part). My sample is dabbed from a glass vial, but I imagine a spritz of Galaad would be fizzy and bright. Galaad quickly retreats to skin, and initially I thought it was simply a fragrance with a short lifespan. Then, a day later, I put on the cardigan I’d worn the day when sampling Galaad, and wow! The wool sleeve wafted velvety tobacco and sweet wood. Delicious. If you sample Galaad, be sure to give it a full day to run through its tricks. Thierry also developed Akkad. Akkad’s notes include amber, mandarin, bergamot, Clary sage, cardamom, elemi, frankincense, styrax, amber, vanilla and patchouli. In brief, to me Akkad smells like a gentleman’s fragrance. Akkad combines deep amber with clary sage in the sweet-woody-ambery-resinous way Parfums MDCI Invasion Barbare and McGraw by Tim McGraw do. To me, this type of fragrance evokes men in expensive restaurants with leather-bound menus and tumblers of scotch. Once the Akkad’s citrus burns off, amber moves right in, but is kept in check by clary sage and the tang of incense. Still, Akkad is definitely an amber fragrance, and if even the amber in Guerlain Shalimar makes you itchy, you’ll want to cross Akkad off your list. I like Akkad best when I really wet my forearm and take in the scent’s fullness. All three of the Lubins strike me the same way I feel when I meet people who at first come off as “straight,” but after knowing them a while I uncover satisfying quirks and interests that will have me looking forward to their company for a long time. With their resinous (myrrh-pine-juniper-rosemary-sage-cypress, etc.) notes, the fragrances seem geared toward men, but all but the most girly of women could wear them happily. Lubin Korrigan, Galaad, and Akkad Eaux de Parfum are $180 for 100 ml. For information on where to buy them, see Lubin under Perfume Houses. I was not impressed with with wither of this three new offerings from Lubin when I was reviewing them half a year ago. If I had to chose one favourite I would say it was Korrigan, but still they don’t surpass Idole, which still remains their most iconic perfume I suppose. They really should do a new perfume that would be even more stunning than Idole. Idole is a wonderful perfume, true! I sampled both Idole EDP and Galaad at the same time back in December, and I was more impressed with Galaad. Since then I got larger samples of all 3 new releases (Akkad, Korrigan, Galaad), and I am still liking the Galaad most out of all 3. I wouldn’t mind owning the Idole, but I have a couple of other incense heavy frags already that seem to fill that niche (Donna Karan Black Cashmere, Tom Ford Sahara Noir). Perhaps the next time I’m near that Galaad I will purchase it. Love the bottles on ALL of them! What I especially liked about Galaad was how it surprised me. I was all smug, thinking I had it pegged as a fresh resinous fragrance, when its warm foundation kicked in. Nice! Okay, you’ve inspired me to go search for my samples of these. I know I had them at one point and sniffed them just briefly but didn’t really have a strong impression of any of them. (And I agree it’s overwhelming when they are released in bunches…) And then I completely forgot about them. But you make them sound so interesting, especially Korrigan. I felt the same way–I sniffed them, then set the samples aside to languish for months. But in the end they were worth spending time with! Hey, that might be our first perfume comment in cat language! Please give Korrigan a scratch under the chin for me. Unfortunately I found all three very unoriginal and unnecessary. Idole is the only Lubin that I’ve found full bottle worthy. Thanks for chiming in! Idole is a difficult fragrance to beat. I have samples of the three as well and did the same thing–sniffed them and put them aside. I have a full bottle of Idole EDP which I love and expected these to be better than they were, but then again, I really didn’t give them much of a chance. There’s nothing like searching for something to review that leads a person to give samples a chance! Thank you. Added these to the try list. You’re welcome. I’d love to know what you think of them.